The following ramblings are my recollections of how the Mid-Illini Jeepers Club came to be back in the late 1990’s. In the summer of 1997, a fellow named Dan Johnson, who lived in Pekin, organized a meeting of Jeep owners. The meeting was held in Pekin on a Saturday afternoon at the pavillion near the Pekin boat ramp. I was living in Pekin at that time and was the proud owner of one Jeep, a 1981 CJ8 Scrambler, which I still own. I came out of the 14th Street Hardware one day and there was a flier on the windshield of the Scrambler talking about ‘Jeep Junkies’ getting together. So, I went to the meeting as a result of the flier. The only two guys I remember from that meeting were Dan and a guy named Ray Miller. I remember specifically thinking that either Ray knew a lot about Jeeps, or he was a big story teller. As the years passed, and Ray and I became good friends, I realized he was both! The results of that meeting in 1997 were that a loosely knit group of Jeep lovers started calling themselves the Jeep Junkies. There were no rules, no dues, and the officers consisted of Dan Johnson as President, and his wife was treasurer/secretary. During the short time this ‘club’ was together, we individually donated money to help pay for whatever expenses were incurred by the club. The only Jeep outing I recall going to with that group was a road trip from Pekin to the bridge which crosses the Mackinaw River south of Tremont on what was then route 121. We convoyed via the backroads from Pekin over to the bridge. On the south side of the two lane bridge, you could drive off the highway and cross under the bridge along the shore of the Mackinaw. It was a first time ‘off road’ for many of the club members. I recall many of the club members getting out and locking in their hubs, and putting their Jeeps in low range. I also remember telling Carol my wife, there was no need to do that cause the trail was hard as a rock, being the middle of the summer and no recent rain. No one aired their tires down, not because it was not necessary, but because they didn’t see anyone else doing it, so they didn’t even understand what airing down does! Anyway, it was a good time for most of them especially after a few beers were consumed under the bridge. The club began to fall apart a couple of months later, mainly because there was no accountability of the money that was donated, which started people questioning the use of the moneys being donated at each club meeting. And, a significant number of people showing up took the name of the club literally, and were in fact junkies to varying degrees. Ray Miller, who I became friends with, was also a friend of a man named Keith Johnston, no relation to Jeep Junkie Dan, and through Ray I met Keith. Keith had been a Jeep guy, got away from them, but couldn’t stay away from them. He also owned a complex in East Peoria, behind what used to be Floyd’s Hardware. This soon became the gathering place for Jeep guys. Keith opened his shop up to just about anybody who had a Jeep. The first frame up Jeep build that took place after I began showing up at his shop was by a guy named CT Woods. He was a full time Coast Guard guy who had a CJ8 Scrambler which he wanted to restore. He bought one of the first fiberglass bodies made for Jeeps from I believe a company in Iowa. This was before 4WD Hardware became a big seller of fiberglass tubs. CT’s rebuild was worked on by numerous volunteers who hung out at Keith’s shop on weekends. Around the time this work was going on in the fall of 1997, the informal group of Jeep guys hanging out at Keith’s, with Keith leading the cast of characters, began talking about organizing a real Jeep club. 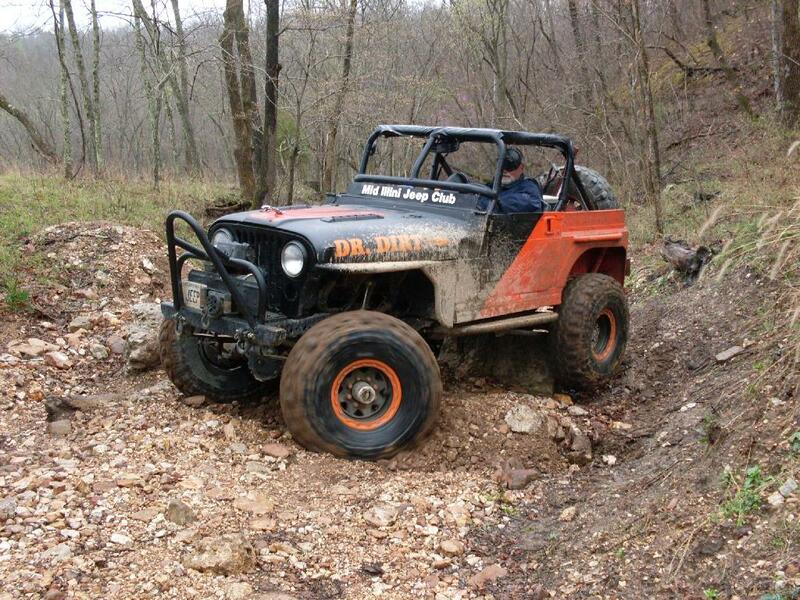 Consequently, in the fall of 1997 the Mid Illini Jeepers Club was born. We had one main rule, to be a club member you had to own a Jeep. The rule has been bent a little bit over the years, but pretty much it still is a commandment for this club. The next year, we incorporated the club. Three signatures were required on the incorporation charter of the MIJC organization. They were Dave Stiles, Ken Peryam, and John Bruder. A lot of muddy trails have been traversed since the early days of MIJC, and they have taken their toll on my memory. The story you just read is close to the truth, maybe embellished a little to make it sound better in certain spots, but for the most part accurate.